Composite graphic courtesy of Dave Thomson. It is the strangest thing, that the world is not full of books that scoff at the pitiful world, and the useless universe and the vile and contemptible race--books that laugh at the whole paltry scheme and deride it...Why don't I write such a book? Because I have a family. There is no other reason. I believe that our Heavenly Father invented man because he was disappointed in the monkey. I believe that whenever a human being, of even the highest intelligence and culture, delivers, an opinion upon a matter apart from his particular and especial line of interest, training and experience, it will always be an opinion so foolish and so valueless a sort that it can be depended upon to suggest to our Heavenly Father that the human being is another disappointment and that he is no considerable improvement upon the monkey. In discarding the monkey and substituting man, our Father in Heaven did the monkey an undeserved injustice. All I care to know is that a man is a human being--that is enough for me; he can't be any worse. I can get right down and grovel with him. It is a solemn thought: dead, the noblest man's meat is inferior to pork. There are three kinds of people--Commonplace Men, Remarkable Men, and Lunatics. Oh, this infernal Human Race! I wish I had it in the Ark again--with an auger! 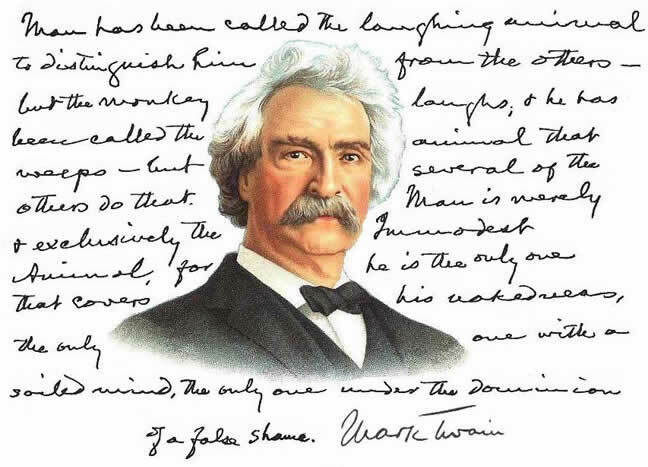 - The American Academy of Arts and Letters pamphlet, "In Memory of Samuel Langhorne Clemens"
I am the only man living who understands human nature; God has put me in charge of this branch office; when I retire there will be no-one to take my place. I shall keep on doing my duty, for when I get over on the other side, I shall use my influence to have the human race drowned again, and this time drowned good, no omissions, no Ark. Man is the Religious Animal. He is the only Religious Animal. He is the only animal that has the True Religion-- several of them. I think we are only the microscopic trichina concealed in the blood of some vast creature's veins and it is the vast creature that God concerns himself about and not us. [Twichell] ... sends me a vast newspaper heading, the breadth of five columns 'Close of a Great Career' in which it is said that I am living in penury in London and that my family has forsaken me. This would enrage and disgust me if it came from a dog or a cow, or an elephant or any of the higher animals, but it comes from a man, and much allowance must be made for man. Man is a Reasoning Animal. Such is the claim. I think it is open to dispute. God's noblest work? Man. Who found it out? Man. Every man is in his own person the whole human race without a detail lacking. To create man was a quaint and original idea, but to add the sheep was tautology. We are nothing but echoes. We have no thoughts of or own, no opinions of our own, we are but a compost heap made up of the decayed heredities, moral and physical. We're nothing but a ragbag of disappeared ancestors. Why, he's the poorest, clumsiest excuse of all the creatures that inhabit this earth. He has got to be coddled and housed and swathed and bandaged and upholstered to be able to live at all. He is a rickety sort of a thing, anyway you take him, a regular British Museum of infirmities and inferiorities. He is always undergoing repair...He has just that one stupendous superiority--his imagination, his intellect. The government is not best which secures mere life and property--there is a more valuable thing--manhood. Man is the only animal that deals in that atrocity of atrocities, War. He is the only one that gathers his brethren about him and goes forth in cold blood...to exterminate his kind. He is the only animal that for sordid wages will march out...and help to slaughter strangers of his own species who have done him no harm and with whom he has no quarrel...And in the intervals between campaigns he washes the blood off his hands and works for "the universal brotherhood of man"--with his mouth. Man was created a bloody animal and I think he will always thirst for blood and will manage to have it. I think he is far and away the worst animal that exists; and the only untamable one. He equips the Creator with every trait that goes to the making of a fiend, and then arrives at the conclusion that a fiend and a father are the same thing! Yet he would deny that a malevolent lunatic and a Sunday school superintendent are essentially the same. What do you think of the human mind? I mean, in case you think there is a human mind. Isn't human nature the most consummate sham & lie that was ever invented? Isn't man a creature to be ashamed of in pretty much all is aspects? Is he really fit for anything but to be stood up on the street corner as a convenience for dogs? Man, "Know thyself--& then thou wilt despise thyself, to a dead moral certainty. I suspect that to you there is still dignity in human life, & that Man is not a joke--a poor joke--the poorest that was ever contrived--an April-fool joke, played by a malicious Creator with nothing better to waste his time upon. ...Man is not to me the respect-worthy person he was before; & so I have lost my pride in him & can't write gaily nor praisefully about him any more. And I don't intend to try. Man has been here 32,000 years. That it took a hundred million years to prepare the world for him is proof that that is what it was done for. I suppose it is. I dunno. If the Eiffel tower were now representing the world's age, the skin of paint on the pinnacle-knob at its summit would represent man's share of that age; & anybody would perceive that that skin was what the tower was built for. I reckon they would. I dunno. - "Was the World Made for Man?" I believe that many a person has examined man with a microscope in every age of the world; has found that he did not even resemble the creature he pretended to be; has perceived that a civilization not proper matter for derision has always been and must always remain impossible to him -- and has put away his microscope and kept his mouth shut. Perhaps because the microscopist (besides having an influential wife) was built like the rest of the human race -- ninety-nine parts of him being moral cowardice.